lforliverpool | My views on Liverpool FC news! My views on Liverpool FC news! The transfer window slammed shut with Liverpool FC not replacing the departing Andy Carroll with another striker, though not because of lack of wanting. Rumours say that FSG refused to sanction an additional 1million pounds to secure Fulham’s Clint Dempsey. Rumours say. But in this technologically advanced age, social media really whipped up a frenzy such that principal owner John Henry was forced to write an open letter to the fans. While the sentiment is right, the letter comes across as being shallow especially when having a dig and the previous owners (rightly so) and justifying their transfer policy. What is important is that they have accepted they have made mistakes, accepted that there is room for improvement and accepted that the transfer window has not been perfect. But the sentiment is right. They have vowed that Liverpool FC’s “existence will never be threatened due to debts” and they will “never place the club is the precarious position” they found it in. That for me is the biggest point. I don’t think most people realise how far we were from administration in 2010. They had never promised to be bringing world-beaters every season and it’s also not as if they didn’t invest in the squad. In conclusion, yes they have made mistakes and they are still learning. But they have a vision, as does our manager. We have waited twenty years, and now can we not wait another couple of years and support the club in implementing a new style and creating a sustainable structure. Implementing all this is going to take time, it will not be easy but it will eventually reward. Let us not sacrifice our future for the present. Let us stop questioning every decision made by the club. Let us have some patience and fully support the club we love. What a week once again for Liverpool! The Reds seems to be having too many of these topsy-turvy weeks lately! As the transfer window drew to a close this week, Liverpool finished most of their business, once again clearing some players who would not fit in to Brendan Rodgers’ style. The outs were Charlie Adam (Stoke), Nathan Eccleston (Blackpool), Jay Spearing (loan – Bolton) and (controversial!) Andy Carroll (loan – West Ham). The only incoming player was Samed Yesil from Bayer Leverkusen. Best of luck to all the players coming or going! While the transfers will have done a lot to reduce the wage bill, the squad does look thread-bare, particularly in strike as Liverpool only have Suarez and Borini as strikers and seeing both are expected to start the games things can become tough easily if injuries start to kick in. Brendan will be keeping his fingers crossed on that one! Lucas also picked up another knock that is likely to keep him out until January so another blow to an already skint squad. Liverpool’s transfer dealings mainly highlight an important point, that you can be sure that FSG are only going to spend money that Liverpool can afford to spend and not pile ridiculous debt on to the club. While it will be difficult to immediately be successful using this policy, it is eventually sustainable and future-proof. Once more while the squad is thinner than last season the quality in the starting eleven has improved and this way of doing business makes sense, buy the players you are confident of rather than a trial and error method. 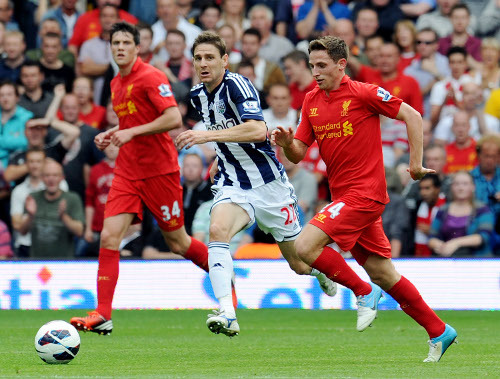 Looking at a player like Joe Allen, he has fit right into the squad as though he has been playing for years. 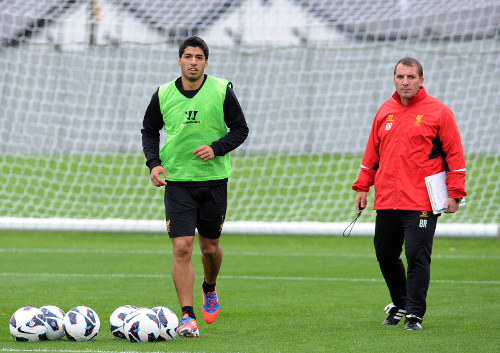 As such Brendan Rodgers is likely to pick particular players he is confident will fit in and add quality to the squad. To those clamoring for FSG to explain themselves over the lack of transfer activity, be patient! So building up on the excellent league performance against the champions last week, the Reds now face Arsenal at Anfield. Both teams have had a slow start to the season and naturally both will be looking for points here. Arsenal do have quite some players out with injuries and following Tottenham dropping points on Saturday, the Reds will be looking to take advantage of that and kick start their campaign. Back 5 pretty much choose themselves. Allen, amazingly has become an automatic starter in this new look Liverpool side. Shelvey deserves another chance after his brilliant performance against City, gave Toure something to think about! Gerrard too an automatic selection. In the front three, we honestly can’t say whether B-Rod will give Sterling the nod over Downing or even Assaidi (doubtful!). While Sterling is an amazing player and would have a right go at Arsenal’s defenders, his age becomes a problem if he is to play regularly. We don’t want to risk burning him out. Those were my two cents! I hope we go out and smash Arsenal! The tough start for Liverpool continues as they face Manchester City in their second league game having lost to West Brom on the opening day. This time though the Reds will be at Anfield for the first home league game. Liverpool are coming into this game on the back of a hard fought but encouraging win against Hearts in the Europa League while resting key players and will also have been further boosted (mentally!) by the loan signing of ex-Dortmund wonder-kid Nuri Sahin from Real Madrid. Daniel Agger of course is missing out this game, having been sent-off against WBA. Carroll is a doubt with a hamstring problem and also Enrique whose fitness will probably be assessed before the game. While there were some good performances against Hearts, there was one player who really stood out head and shoulders above the rest – Raheem Sterling, giving the Hearts’ defenders a lot to think about. A start for him would be too risky but perhaps if the game is level and a change of pace is required he would certainly be an option. Also, Assaidi who has almost been forgotten about may well make his debut tomorrow. That would be it I guess unless Assaidi is handed an unlikely start for his first game and Enrique is fit, it is doubtful the line-up would vary much. While Downing has still not won over many fans, he is the least riskiest option available there. Suarez would pretty much be roaming freely and swopping places with Borini with Gerrard up in support. No doubt a baptism of fire for Brendan Rodgers but Liverpool usually do turn up in the bigger games so we would be a bit less worried about the game! But let’s see if we can get our first points of this campaign on the board! What a first game! Really put a dampener on the preparations and optimism surrounding this season, but relax, there is still a long way to go! Nobody can say the Reds played badly, they were quite good in the first half only falling behind to Gera’s wonderful volley, but once again it was Liverpool’s profligacy in front of goal that came back to haunt them. Liverpool started well enough, lining up in a lopsided 4-3-3 formation with new signing Joe Allen making his Liverpool debut, and had a great number of chances, most created by Luis Suarez but unfortunately failed to convert them. Well, at least they didn’t hit the post! Suarez had Liverpool’s best chances of the game, a header from point blank range that was sent over, a gift from Ben Foster that he blasted over and another header too which he headed wide. Agreed that he is doing well to get in those positions to score but he is under pressure as most of the time he is the creator as well as the scorer. Luis is a brilliant player, but too much is being expected from him! Seeing Saturday’s stats, the frontmen really need to get serious about their business, because, quite frankly they were not in the game! There were a total of 9 shots taken, 7 from Suarez and 1 each from Johnson and Borini. You cannot expect Borini and Allen to start banging in goals immediately, so understandably their attempts would be low, but for a seasoned player like Gerrard or even Downing that is quite shocking! The game was a shocking one overall. Liverpool were complacent, judging from the misplaced passes and cheap penalties given away. It was just the first game, no doubts they will improve! 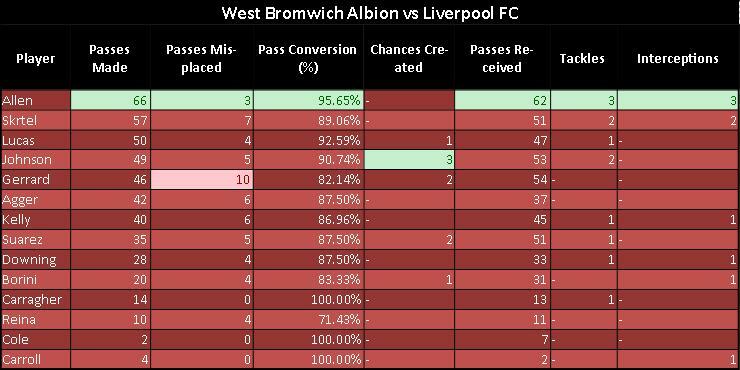 West Brom on the other hand were a different side altogether. Had it not been for their poor finishing it could easily have been five goals! In the positives Joe Allen impressed, with a pass conversion rate of almost 96% and chipped in with 3 tackles and interceptions, the highest for Liverpool. There are a still a few areas that need to be improved on, mainly in front and at the back. A striker is a must and if Borini has been bought with this in mind then play him there, or play Carroll there. Suarez alone is just not going to cut it! A new winger was also necessary, and Assaidi will be a welcome addition to the squad, especially because Downing lacks the confidence to beat his man and sometimes it is frustrating to see him pass back. Lastly, a secondary left back. Liverpool do not have anyone to fill the void in the left back position if Enrique is out and while Johnson is a solid backup, he is not a permanent solution. Refereeing decisions were debatable and perhaps a tad harsh, but the contact was there in both cases, though with Agger, it seemed to be outside the box. But these things happen. We should be making our own luck and not lamenting decisions. All in all, an unexpected result, but a learning experience especially for identifying weaknesses in the squad. Things will get better as the new players start to gel and the old players get used to the way Rodgers wants them to play. It’s been three long months, too long isn’t it? Finally PREMIER LEAGUE IS BACK! Three months of waiting, guessing, predicting, hoping and expecting finally boil down to this day, opening games of the 2012-2013 season! Liverpool have been busy, incorporating new faces into the squad such as Allen and the surprise signing of Moroccan winger Oussama Assaidi. Rumours are still flying about the loan signing of Nuri Sahin and potential move for Clint Dempsey, however there is still nothing concrete. The squad is shaping up well now with good cover in most positions. Liverpool open this season with an away game against West Brom, now managed by Steve Clarke. Both teams have new managers and will be looking for the points, but I hope Steve is disappointed this time. This is the 12th time in the last 17 seasons where Liverpool have started their campaign away from home. Should Steven Gerrard captain the team on Saturday (as he will! ), it will be his 250th game as captain in top flight! This team has a solid defence as proven last season, a great midfield engine, in both Lucas, who was sorely missed last season and Allen, excellent on the ball; it has the incisive passing and creativity of Gerrard and the movement and guile of the three frontmen. All in all, it would seem to be our strongest team. While hope always exists with Liverpool fans, something is different this time, there is also a sense of optimism and I guess we will find out in the first five games of the season, exactly where we lie. The opening game last season pretty much set the tone for the season, with Suarez missing a penalty, Downing hitting the bar and points being shared, so lets see what this season holds in store for us! Well, an exciting week for Liverpool fans as the Reds played their opening home game at Anfield. While the opponents were not the strongest, there is no doubt it was a wonderful game by Liverpool. Some slick passing and movement, combined with the unpredictability of Suarez, intelligence of Gerrard and lethal finishing by Borini and Johnson ensured that Brendan Rodger’s first game at Anfield was one to remember! The Reds started of really well, and were unlucky not to see Suarez score from an early linkup with Gerrard, but the Uruguayan was to be a creator on the day and not a scorer! 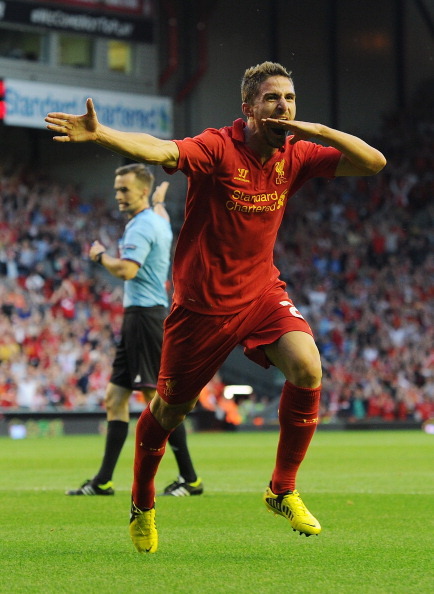 Rodgers had named a strong lineup and in the end it was too strong for FC Gomel as the effervescent Suarez squared the ball only for it to come off a Gomel player and fall to Borini who fizzed an amazing first time shot under the keeper to score his first Liverpool goal on his Anfield debut. The scintillating Uruguayan was at it again when he danced past a couple of challenges and laid it onto a plate for Gerrard to score, what I believe, was his 150th goal! Gerrard was unlucky to not add a second when his shot from the edge of the box smashed against the post! And then in the seventieth minute Johnson chased a clearance, chested it down and smashed a thunderous left-foot volley past the keeper to make it three to Liverpool! It was an amazing game, some wonderful football displayed! Okay, it was a weak side we were up against but still amazing to watch and a change to see eight Liverpool players in the opponents half at one time. This is the way we want to be playing! In transfer news Liverpool bid farewell to Craig Bellamy, who returned to Cardiff City. He won’t be forgotten having scored the vital goal against City to send us to our first Wembley trip this year! Best of luck Craig! 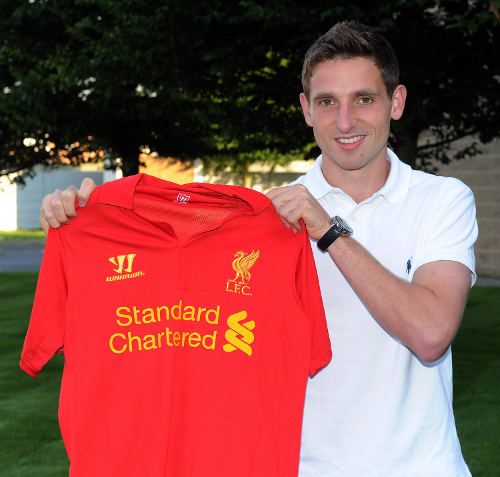 Also Liverpool welcomed new signing Joe Allen from Swansea. He has been an excellent player for Swansea and hopefully he can replicate that form for us and chip in with the occasional goal! All in all, a pretty good week for Liverpool, what with Borini scoring and Gerrard proving his doubters wrong (the lad’s still got it!!) and of course, Suarez in his hungry mood, meaning we can look forward to this season! Do wning’s brilliant shot separates the two sides as FC Gomel visit Anfield to avenge defeat. A lot has been going on behind the scenes at Anfield, best news being Luis Suarez’s return and signing of an extended contract. Daniel Agger is also taking part in training though a lot of rumours circulating about a potential bid from Manchester City and also Craig Bellamy rumoured to be in talks with Cardiff City, so we might yet be seeing some changes! Pepe Reina is also back in training so everybody seems to be around. Carroll still seems to be unavailable with the knock he picked up last week. So, finally the first home game of the season, a European tie, so hopefully Anfield will be a cauldron of noise on Thursday night! Liverpool are carrying a 1-0 lead over FC Gomel as they head into this tie and it will and should be quite difficult for Gomel to get much out of this game, what with the Reds getting a week of solid training. Let’s see how Liverpool’s first home game turns out.